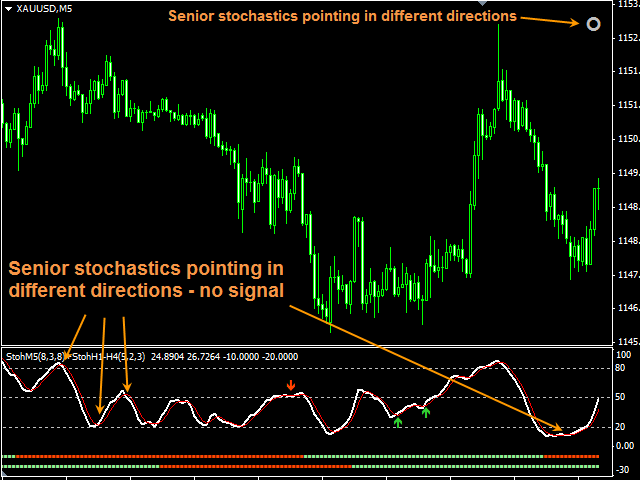 This indicator signals about crossing of the main and the signal lines of stochastic (lower stochastic) in the trend direction which is determined by two stochastics of higher time frames (higher stochastics). It is not a secret that stochastic generates accurate signals in a flat market and a lot of false signals in a protracted trend. A combination of two stochastics of higher time frames performs a good filtration of false signals and shows the main tendency. The indicator is recommended for use on volatile instruments. The lower stochastic is shown by two usual lines (main and signal), directions of higher stochastics are visualized as two colored squares. You can variously combine two higher stochastics and disable any of them. 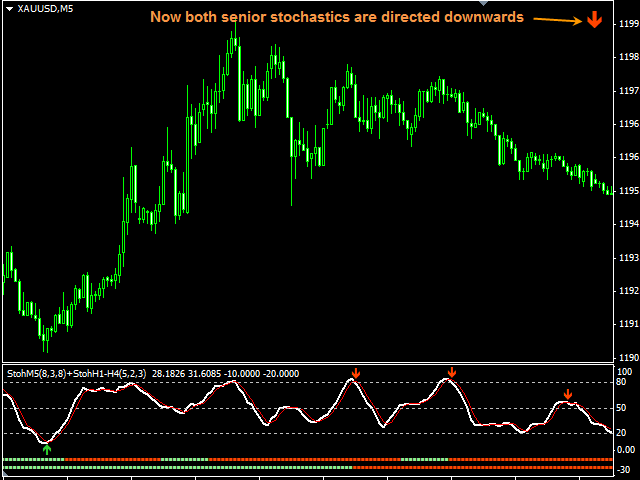 Label in the upper right corner will show you the trend direction: arrow up or down indicates that higher stochastics' directions coincide, 0 indicates that stochastics have different directions (in this case the signal will not appear). A possibility to signal when lines of the lower Stochastic are reversely crossed (against the trend) for an early exit from a deal. 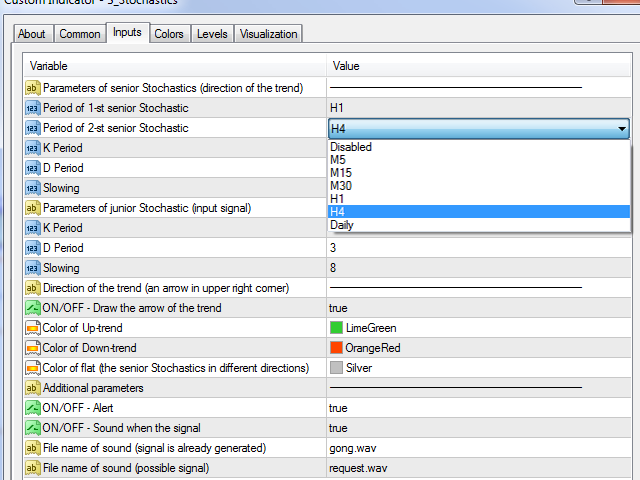 You can enable and disable this option using a button in the lower right corner of the chart (an adjustable parameter). Enable this button only if you are in the market and wish to close a deal according to reverse crossing of the Stochastic. You can remove this button from the chart if you do not need this option (“ON/OFF - Reverse signal button”=false). It can send emails and push-notifications to mobile devices. Without question this indicator is one of the greats, fits all the master trading concepts of trading with the trend and momentum plus the ability to filter the alerts . Excellant indicator and excellant support from Pavel . Will be testing this for a few days, be back with results so far its done good, please add an alert tho when the k and d line crossover in the levels we specify.. I trade on higher time frame. This is a scalpers indicator. No W1 or MN option on the indicator parameter. Very disappointed in the purchase. Throwing it into the bin. .
Хорошие результаты только на истории с перерисовкой вот и все... В реале все плохо как не крутил настройки, такое ощущение что индикатор работает пальцем в небо либо угадал либо нет,ложных сигналов куча.По началу индикатор показался много обещающим, а на самом деле деньги на ветер, для слива депозита самое то! the majority in this world. I prefer to pay much but to buy something sincere. I suggest to not buy this indicator, waste of your money. It is a very useful tool. Thank you. Протестировал данный индикатор в течении 1 недели в демо версии на GBP/USD на графиках от М1 до М30 и самый оптимальный вариант для торговли я считаю это М5 и М15. Последнее время увлёкся бинарными опционами и давно подыскиваю индикаторы для ручной торговли, т.к. в советниках полностью разочаровался и в маркете в том числе, т.к. просят по штуке и более грина $, а даже мониторингов нет, что уж там про демо-версии говорить. Тестировал именно на бинарных опционах данный индикатор. Сейчас мало брокеров дают демо-счета на опционах. Я работаю с робофорексом (кому нужны ссылки и инструкции пишите в личку). Так вот на робе отличные конкурсы как по форексу, так и по опционам с реальными призами. Я как то случайно один раз у ник 5-е место занял в конкурсе по опционам, получил 110$ реальных средств, ну естественно их в итоге потерял, сейчас опять в конкурсах учувствую, но нужны хорошие индикаторы для построения собственной стратегии и на мой взгляд индикатор Павла заслуживает пристального внимания. На М1 сигналов много, но они не точные, а на М5 и тем более М15 за день всего несколько сигналов, особенно если рынок спокойный. Я за неделю в демо на бинарных опционах сделал 100% от депо по паре GBP/USD. Прибыльность по сделкам примерно 70:30. Сейчас хочу проверить в мультивалютной торговле, поэтому и решил купить платную версию, к тому же цена по сути смешная. В конце апреля 2015г. постараюсь обновить свой отзыв и дописать какие получились результаты. Павлу респект. Побольше бы таких индикаторов. 1. Added timeframes W1 and MN. Now, the indicator can be used by an Expert Advisor to receive buy/sell signals via the iCustom() function. Buy signals use the 0 indicator buffer, while sell ones - the first indicator buffer. 1. Now, you can manage the areas where the younger Stochastic generates trade signals ("BUY-signal if Stochastic below this level" and "SELL-signal if Stochastic above this level" parameters). I express my thanks to the trader fab13 for this idea. 2. Added a new indicator calculation mode - now, the Stochastics of higher timeframes are simulated on the current TF (New Mode option), thus removing the main drawback: the indicator does not repaint now at all! Besides, you now can fully test the indicator in the MT4 tester. The old indicator operation mode has been preserved for compatibility (Old Mode option). 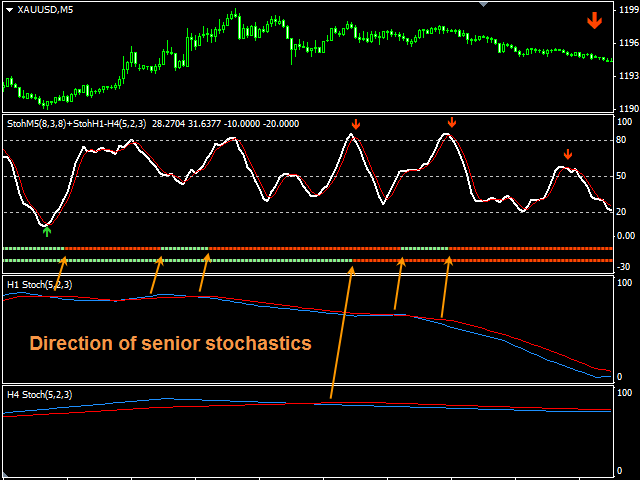 The data of older Stochastics are written in the same way as before - regardless of the selected calculation mode. Note: since older Stochastics are simulated on the current TF, there may be minor divergences with the readings of these Stochastics on higher timeframes. Fixed bug which could occur in boundary states of higher stochastics. It could cause incorrect signals. I'd like to thank dh9999 for discovering this bug. 1. Now it sends emails and push notifications to mobile devices (ON/OFF-Mail and ON/OFF-Push parameters). 2. Two languages of message: English and Russian (Language parameter). 1. Fixed error: sometimes there was a signal with bi-directional higher Stochastics. 2. 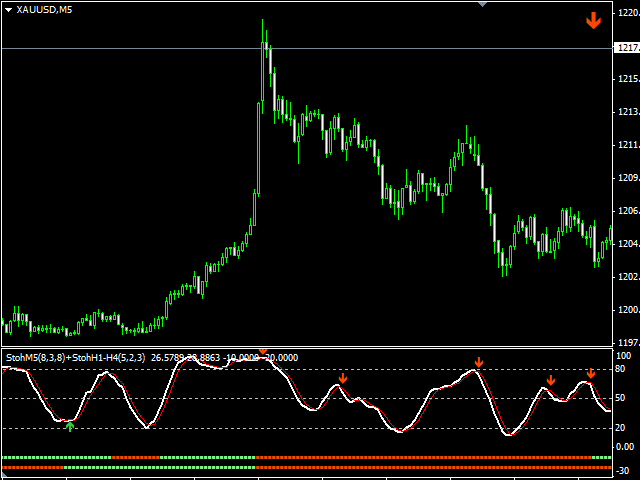 Added an optional signal when lines of the lower Stochastic are reversely crossed (against the trend). I use it for early exit. 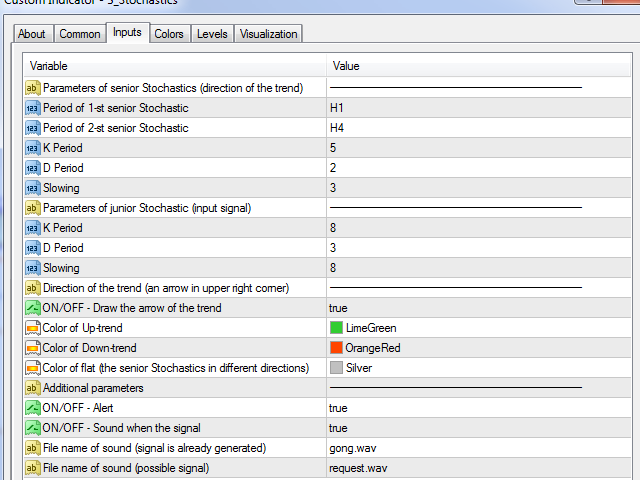 You can enable and disable this option using a button in the lower right corner of the chart (adjustable parameter). Enable this button only if you are in the market and wish to close a deal according to reverse crossing of the Stochastic. You can remove this button from the chart if you do not need this option (“ON/OFF - Reverse signal button”=false). Indicators using data from higher timeframes have one considerable drawback: they can change their values till the higher timeframe bar is closed. Thus, such indicators redraw the signals after a reset. In the new version, the indicator saves its status at each bar for the entire operation time. This prevents it from redrawing the signals, and you can see the same picture in history that you have already seen in real time.